May is a special time in Anchorage. It’s when king salmon begin the trek back to their spawning grounds and when anglers line the banks of Ship Creek. This season is already starting off on a good note. Our first fish was caught May 15 and we’ve already had more fish earlier this year than last year. I’m hoping this is a sign we’ll have a strong return this season. Normally, our first kings aren’t caught until May 25 or so. For those of you who aren’t familiar, Ship Creek is located in the heart of Downtown Anchorage and provides public access to anglers looking to catch king salmon without having to spend big dollars on a guide or fishing lodge. The creek hosts Chinook (king), coho (silver), pink and chum salmon. Kings begin to arrive in mid May and can be found in the creek until the July 13 closure. Salmon are here now. However, the run will continue to build until the third week in June, which is when it normally peaks. You can still catch kings all the way to the king salmon closure. There will be kings in the creek into August, but we can’t target or keep them after the season closure. Last year our kings ranged from 15 to 52 pounds. According to the hatchery there were more than four kings that breached 60 pounds spawned last year. Catching a king is not that challenging. The most consistent way to get bit is with bait (salmon roe). Ship Creek is one of the few bait friendly waters for salmon in South Central Alaska. 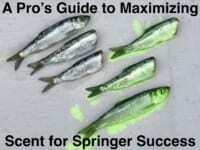 The reason bait is allowed is because the system is hatchery supported. Without the Jack Hernandez Sport Fish Hatchery there likely wouldn’t be a run of king salmon here. Ship Creek is tidal driven. Tides dictate how we fish. When the tide is moving in or out we generally set our bait on the bottom of the creek using a Spin-N-Glo with a 4/0 to 5/0 fixed mooching rig. A one-to-four ounce pyramid weight keeps the bait on the bottom where the salmon are. The amount of weight used depends on the speed of the current. Meanwhile, during slack tide it’s better to drift eggs under a slip float. This allows us to adjust the depth and keep in contact with where the salmon are in the water column. 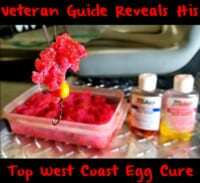 With both methods of bait fishing the one thing that is in common is that we use Pautzke Fire Cure to cure our salmon eggs. Red and Orange Fire Cure are the mainstays here. Pink and natural aren’t the main colors on this system for kings. We’re using roe about the size of a half dollar. Either fishing on the bottom with a Spin-N-Glo or drifting eggs under a float it is always essential to start with good cured eggs. Time and patience is the other key aspect when fishing for kings. The best bite is always three hours before to three hours after the peak high tides. During that period the tides push fresh fish into the creek. When the tides turn it pushes them back out into the creek unless the salmon are committed to head up the creek to spawn. Editor’s Note: Dustin Slinker operates The Bait Shack along the banks of Ship Creek. The Bait Shack is the only streamside bait & tackle shop and sells licenses, offers gear rentals and guide services on Ship Creek. For more info please visit www.thebaitshackak.com or https://www.facebook.com/thebaitshack. Special Note: Checking the regulations with the Alaska Department of Fish and Game is also important to ensure regulations haven’t changed and you are fishing within the laws. You don’t want a ticket. You want a king! Currently, anglers are allowed to keep one king a day (that’s greater than 20 inches) and five king salmon per season. Ship Creek is only open to fishing from 6am to 11pm.